Into his waking hours Denny Zeitlin manages to work fly fishing, mountain biking, master-level wine connoisseurship, the practice of psychiatry andlet’s see, there was something else. Oh yes, he plays the piano. In his mid-seventies, Zeitlin shows no inclination to slow down in any of his pursuits, least of all at the keyboard. Following a remarkable recording debut with the flutist Jeremy Steig in 1963, the pianist went on to record frequently with trios that have included some of the music’s most celebrated bassists and drummers. In the past few years, he has frequently also appeared unaccompanied on recordings and in person. His next solo date is scheduled for a week from this evening at the Piedmont Piano Company in Oakland, not far from his home in Marin County, California. In a note, Zeitlin commented on the hall’s unusual sound qualities. The venue is unique: The Piedmont Piano Company has a large showroom, packed with all makes and styles of piano, breaking up the standing wave phenomenon that haunts many performance spaces. The resultant acoustics are great, and the choices of instrument for the performer are phenomenal. 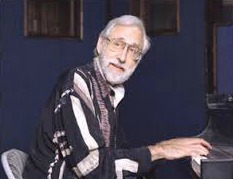 “Quiet Now” was adopted in the 1970s by piano icon Bill Evans, giving the musical aspect of Zeitlin’s career and, no doubt, his ego, a substantial boost. It remains one of the Zeitlin compositions most often recorded by others. Thanks, Doug, for the video. A beautiful piece of music played by a master. If only I were still in the Bay Area. Reminded me of Bill. Jessica Williams’ rendition of “My Foolish Heart” from her With Love CD is another recent gift I received. My wife and I drove up from Santa Cruz to attend this concert. It’s a wonderful venue and Denny is a fine player. The program was devoted entirely to the music of Wayne Shorter, and was a reminder to me of why I was never able to connect with Miles’ bands based on Shorter tunes — I just don’t connect with Wayne’s writing. That is probably my issue, but it’s real for me. The Piedmont Piano company venue is excellent in every way. Audience members and performer are treated well, the acoustics are fine. Denny played what looked like a 9 ft Yamaha, and it sounded great in the room. Acoustically, this was a real treat. My wife, completely non-technical with respect to music and acoustics, really dug the acoustic clarity of the un-amplified piano working with only the natural acoustics of a very nice room. She immediately understood my extreme dissatisfaction with what I hear at our local venue, Kuumbwa, where amplification is extreme and poorly done. Like me, she found the music dull and repetitive.